Albizia bark (Hehuanpi)-Albizia julibrissin Durazz. Botanical Name: Albizia julibrissin Durazz. Common Name: Albizia bark, Mimosa tree bark. Part Used & Method for Pharmaceutical Preparations: The bark is collected in summer or autumn, and then cut into pieces. Functions: 1. To tranquilize the mind and relieve depression; 2. To invigorate the blood and reduce swelling. 1. 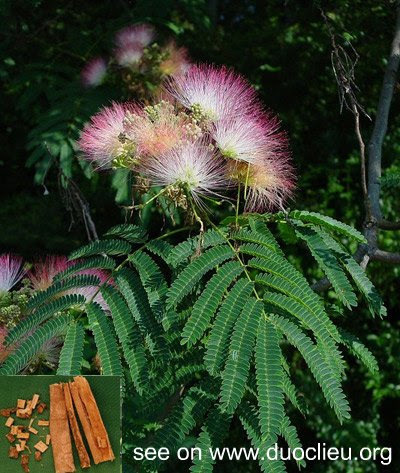 Insomnia, forgetfulness and irritability due to depression or anger: Albizia bark (Hehuanpi) is used with Arborvitae seed (Baiziren) and Multiflower knotweed (Yejiaoteng). 2. Swelling and pain due to external injury: Albizia bark (Hehuanpi) is used with Chinese angelica root (Danggui) and Chuanxiong rhizome (Chuanxiong). 3. Carbuncles and furuncles: Albizia bark (Hehuanpi) is used with Wild chrysanthemum flower (Yejuhua), Dandelion herb (Pugongying) and Forsythia fruit (Lianqiao).